A while ago I wrote a post on how to run a Visual Studio Online (now called Visual Studio Team Services) Build Agent in a Docker Container on Linux. I got some good feedback on this post and now it is time to do the same trick again but only on Windows. Yes ! You read it correctly, a Docker Container on Windows !. Since Windows Server Core 2016 CTP 3, Docker is natively supported on the windows platform. We can run containers here the same way as we do on Linux. I have already did some pre-blogposting before this post so this post is more a wrap-up to finally run the agent in a Docker Container. For reference please take a look at these blog posts I wrote before to get you up to speed. Especially the post around Create a Windows Docker Host and connect to it without Visual Studio is important to read to get started. A lot of work already has been done by finding out how to create a Docker Host and start an agent interactively, the challenge was, how can I put this in Docker container and make it reusable. To create a windows based Docker image, we first create a Docker file that builds on the Windows Server Core base image. We also want the Docker image to contain some variables that contain information for our build agent. We use Environment variables for this purpose. We do not want that our Docker image contains sensitive information so we do not put it in the real values. But if you do not provide A value for the environment variable in the Docker file, the Environment variable will not be created. Let’s now build this image so we can start using this image with some environment variables as our base image. docker –tlsverify build -t rvo/vsobuildagent:Base . docker –tlsverify build –t rvo/vsobuildagent:v1 . The container with this file is now also created. 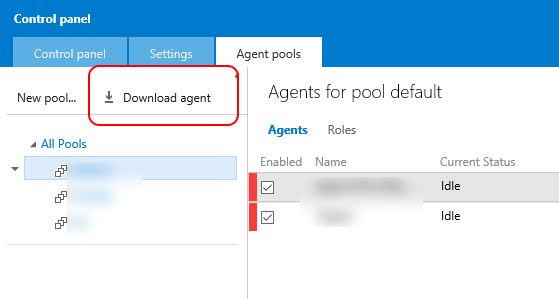 This automatically starts up the agent! When running the same configuration command manually outside the container it works as expected. No, not that I know of. Can you Ping the TFS server from within the container ? Yes I’m able to ping the TFS server and can also do a invoke-webrequest via powershell with authentication successfully. I noticed when connecting to my own Visual Studio Online it authenticated properly. I decided to spawn another server and install TFS15 (instead of production TFS2015). With the new TFS15 agent and using PAT authentication I’m able to connect to the new TFS server. I still find it a bit weird but at least I’m able to continue.